As I mentioned a few days back that I would be sending out user interviews to the most active Cheerful Ghost users. I emailed BR and he awesomely answered my questions. Ill send out more over the next few weeks. If you don't get a email right away, fear not ill get to you all. jdodson: I know a bit about this already, but I wonder if you can let us know why you chose BR as your screen name? BR: For those who don't know, BR stands for BlueRooster. This has been my screen name for the past few years. I first came up with it when creating an account to play Global Agenda. I mostly like it because its fairly simple and unique. I've never met someone... Read All As I mentioned a few days back that I would be sending out user interviews to the most active Cheerful Ghost users. I emailed BR and he awesomely answered my questions. BR: For those who don't know, BR stands for BlueRooster. This has been my screen name for the past few years. I first came up with it when creating an account to play Global Agenda. I mostly like it because its fairly simple and unique. I've never met someone before who has the same name and I never have trouble creating an account with the name. That is, except for my youtube channel which is BlueRooster43. Oh, and BR is my screen name on CG because I felt like it would be fun to go by an abbreviated version of my screen name. jdodson: What kind of game genre is your all time favorite? BR:I'd say my favorite game genre is probably Open-World rpg's. Such as games like Fallout 3 and Skyrim. I enjoy being able to do what I want and not having to follow a specific story. I still enjoy certain linear games but not as much as an open-world type game. jdodson: If you saw The Dark Knight Rises, I wonder... Did you want another movie after the ending credits rolled? BR: I woudn't mind another Batman movie, but I don't feel like they need to make another. I do think it would be cool if they had a movie with the riddler, but its not needed. I feel very content with the current movies. jdodson: I wonder what really upsets you about gaming now? BR: I'd have to go with the extreme amounts of dlc and how much they are overpriced. I can't afford to pay $20 every month for a new map,character, or mission on my favorite game. I wouldn't mind if expansions came back for $40-50 because they included much more content and were spaced out over time making them affordable. jdodson: Whats the most fun multi-player experience you've ever had? BR: This is a very hard one for me. I play tons of multiplayer games and its hard to choose which one had the best impression on me. After thinking about it I would have to go with either Garry's mod or TF2. These are both games I've put tons of hours into and feel the multiplayer is very well done. Garry's mod because I enjoy the huge modding community and there is always a new gamemode to try out. TF2 because they have many little things that give you goals for playing just a simple objective/deathmatch game. Not to mention both of these games are constantly being upgraded. TF2 always has updates to make the game better and Gmod has a modding community that never sleeps. There is always new content in both these games. jdodson: What is the best music to listen to while gaming? Or do you typically just listen to the in game music? BR: I enjoy listening to music in games that does not have important dialogue. This mostly consists of multi-player games and a few single-player ones. If I had to choose what music to listen to, I would go with some type of electronic or dubstep. Stuff like deadmau5, knife party, and kill the noise. This is just stuff I listen to while gaming, I like other music than this also. jdodson: In the current(some could say last) gen of console gaming of the Wii, PS3 and XBox 360 I wonder which of the lot you preferred? Did you get more games on one over the other? BR: I would pick the XBox 360 for the simple fact that I own way more games on it than any other system. I have a ps3 also but only own 2-3 games on it. XBox also has a lot of games that are unique to it. jdodson: What game did you just finish playing last? Like the actual last game you closed before reading this email. BR: The last game I played is Atom Zombie Smasher. I just bought this game the other day and am having a lot of fun with it. Its a nice simple strategy game that I am absolutely horrible at. I'm still learning how the game plays so I hope that I will get better. jdodson: What are your thoughts on Disney buying Lucas Film and by proxy the rights to Star Wars, Indiana Jones and all associated with them? BR: I'm very fearful of what Disney might do to the Star Wars franchise. I fear that they will screw with the original story. I am still hopeful,however, that when a 7th star wars episode is released, it will be worth watching and will not disappoint me. jdodson: Whats game company do you think stands out above the rest? BR: I'm not really sure about this one. I would say Mojang because they have come from almost nothing to a huge success. Minecraft is one of the best games I have ever played and it was developed originally by a single person. Mojang has come a long way in a very short period of time making me think of them as a company that stands out above the rest. jdodson: If you could force a game studio to make a game, what would it be? BR: I think many of you would agree when I say I would force Lucas Arts to make BattleFront 3. The first two were major factors in why I enjoy gaming today. I played them all the time as a kid. Also, I am waiting for Fallout 4. So if the first option didn't work out, I would go with that. Time Walk Games makes physical prints of NES and SNES games. These shrink wrapped modern game carts are of fan game creations and translations. When I found TimeWalk Games online I was impressed with quality of what they produce. I was able to sit down with Spencer from TimeWalk Games and ask him some questions about what they do and threw in a few other bits as well. jdodson: Recently you released Final Fantasy Ages for the Super Nintendo. How long does it take from the initial concept to launch? What process is involved to launch the game? Spencer: The artwork, manual and map design can take anywhere from a week to a few months depending on the type of game that it is.... Read All Time Walk Games makes physical prints of NES and SNES games. These shrink wrapped modern game carts are of fan game creations and translations. When I found TimeWalk Games online I was impressed with quality of what they produce. I was able to sit down with Spencer from TimeWalk Games and ask him some questions about what they do and threw in a few other bits as well. Spencer: The artwork, manual and map design can take anywhere from a week to a few months depending on the type of game that it is. RPG manuals tend to take a very long time to design due to the large scope of the games. Typically when when we decide to release a game in CIB we ask one of our roughly fifteen different graphic designers to develop the printed resources for the title. From there its just a waiting game. We never rush them as that would seriously degrade quality, and our standard has always been to match the quality of the original releases. jdodson: Do you work along side the fan communities that create games to publish these carts? Spencer: At the moment no. Unfortunately there are some differences of opinion between rom hackers, translators, and repro-makers, and always has been. Repro makers cater to those who want to play games on the original hardware. We specialize in bringing the game to the gamer as closely as we possibly can to what the game would have been liked if it would have had an official release (How's that for a run-on sentence). We love to see unboxing videos of our games, because when you see the customer remove the shinkwrap for the first time, you can see them transported back 20 years too when they we're buying these games as a kid. That's the biggest reason that we do this. I loved the way games used to be. Not just the game, but the packaging, manual, the whole bit. I have very little taste for modern gaming. Especially the packaging. Have you noticed how bland the packaging is for consoles now? Just look at the packaging for the 3ds compared to the original NES and SNES packaging. The 3DS packaging is very bland and sterile. You wouldn't even know it was a gaming device. The NES and SNES packaging are fantastic! Colorful and bold! They just scream fun. But anyway, I've gotten away from the question. It is my great hope to see the various communities that are involved in these games come together and get past their differences. There is so much talent out there, and the gaming community owes so much to the various translators and hackers out there. jdodson: What’s your favorite game you have published so far? Spencer: That's hard to say. Some of the earlier ones such as Zelda Outlands was my design for the printed materials, and I've always been very proud of it. Its really hard to choose just one. My top pics at the moment that isn't my work are All New Punch Out, Mystic Quest Reborn and Metroid Deluxe. jdodson: The original Nintendo and Super Nintendo came with lock out technology to avoid unlicensed games. How do you get around this? jdodson: If Nintendo decided to make a 2D retro styled Zelda game what direction would you like to see it take? Spencer: A sequel to Links Awakening. LA was my favorite Zelda game of all time. It played similar to a link to the past and it had a fantastic humor through out the game and the music is so memorable. Just charming in every way. I don't really feel like the next few Zelda games have to be huge and epic. jdodson: How do you ensure when you run a game cart, that it works properly on the hardware? Spencer: We simply test it on real hardware. Build the game, clean the pins and see if it works. We only test on genuine SNES and NES hardware though. There are so many clones out there that it would be to difficult and time consuming to test on all of them, though I hear the Retro-Duo is quite for compatibility these days. Most of the clones have problems with the Super FX chip though. jdodson: What tech do you use to store the game code on the game cart? Spencer: A combination of flash memory, eproms, converter boards and anything else we can use. Its something of a magic trick to modify old hardware in this way and we are always learning better ways to do it. jdodson: To date, what has been your most successful game published? jdodson: In Portland, we have a large Retro Gaming Community with the Portland Retro Gaming Expo and awesome arcades like Ground Kontrol. What’s your local Retro scene like and how involved is Time Walk Games in the Retro Gaming community in your respective areas? Spencer: Sadly, our local scene is not very big. We own a brick and morter store in the area that specializes in retro gaming, comics, magic the gathering etc. Retro gaming does OK, but isn't huge, and we work very hard to promote it locally. Based on our sales for Timewalk, I would say retro gaming is actually significantly stronger in other parts of the world such as Europe and Australia. jdodson: What did you think was the most offensive part in the Star Wars prequels? Spencer: Dear lord where do I start. The fact that they we're made at all just to begin with. The cut and paste story line. The horrible CG. If I had to pick one thing though I think it would be the whole concept of Midiclorines. And yes, I know it didn't spell that right. It offends me so much I won't even take the time to properly look up how to spell it. But basically, the idea of retro actively changing the concept of the force from a spiritual concept to a scientific concept ruined the movie for me. I have to block out the idea that the prequels even exist to enjoy 4 through 6. A lot of people hate Jar-Jar Binks. I really don't have a problem with the character. Yes, he is somewhat annoying, but there are a lot of annoying characters in Star Wars (Ewoks anyone). I can stomach another one rather easily. jdodson: You published Secret of Mana 2 fan translation on the Super Nintendo because it wasn’t published in the United States. Secret of Mana is one of my favorite games of all time, thank you for doing this! jdodson: You ask fans to trade in certain games so you can recycle old games to publish future games. This is a really awesome idea! Are you able to get enough trade-ins to meet your publishing demands? Spencer: Not even close. We are constantly searching and scouring for donor carts. We also have a policy to use only games that are terrible over produced games as well. Games that will more than likely end up in the landfill. That means no Zelda carts to make a Zelda Outlands. jdodson: What’s a better way to travel through time? Delorean or Phone Booth? jdodson: Thanks for taking the time to answer my questions! Anything else you want to mention I didn’t ask that people should know? Not to mention that a phone booth can be fixed with gum, whereas a broken Delorean has to be hit by lightening, or pushed by a train. Agreed, the phone booth is much a much sturdier design. I wish he would have elaborated more on the differences between what he does and romhackers and translators. I follow the romhacking scene religiously for all of my retro gaming. Aeon Genesis has always impressed me with its huge array of translated old school games. I hope to one day see those translations put into a box print like these guys do. After getting into table top gaming a few years ago I started following Fantasy Flight Games and the work of Kevin Wilson in particular. For me, Kevin's games stand above others in their creativity and gameplay. It was a joy to be able to ask him questions and I hope you find it as interesting to read as it was to take part in. jdodson: I want to thank you for taking the time to answer my questions. I am wondering if you could give a quick rundown of your history with gaming and what you currently do for Fantasy Flight Games? Kevin Wilson: No problem. I've been gaming for about 30 years now, getting my start as a D&D roleplayer way back in the day. After... Read All After getting into table top gaming a few years ago I started following Fantasy Flight Games and the work of Kevin Wilson in particular. For me, Kevin's games stand above others in their creativity and gameplay. It was a joy to be able to ask him questions and I hope you find it as interesting to read as it was to take part in. Kevin Wilson: No problem. I've been gaming for about 30 years now, getting my start as a D&D roleplayer way back in the day. 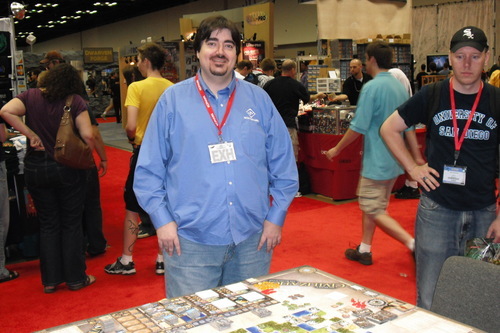 After that, I managed to fall into a position at Alderac Entertainment writing RPG books for several years, then moving to Fantasy Flight Games, where I wound up in the board game department. At FFG, I've worked on a number of their board games over the last ten years, including A Game of Thrones, Arkham Horror, Descent: Journeys in the Dark, Android, and Sid Meier's Civilization. jdodson: Recently you had a hand in the Fortress America reboot. I wonder how the process was refreshing the original? How involved was Hasbro in the process? Kevin Wilson: Mostly I talked to Mike Gray to see if he had any thoughts on things he'd like to see changed. Hasbro was very hands-off for the small bits of redesign I did and in general I tried to have a very light touch because I felt Fortress America was a very good game already. jdodson: As you think back to the games you have created I wonder which one you look back at as your best work? Kevin Wilson: That's a tough call. I think that my work on Android is perhaps the work I'm _proudest_ of, but I don't think it's my best work, necessarily. Arkham Horror was certainly the most successful work, but I think I have to give the nod to Sid Meier's Civilization: the Boardgame as my best work to date. I had a good amount of time to really engineer that game, and I felt I was able to weave a lot of interesting mechanics together into a game that really felt like the computer game while still retaining an identity of its own. jdodson: When you are creating a new board game how long and involved the process is for coming up with the initial concept to playing the first version of the game? Do you play it by yourself generally or with others? Kevin Wilson: It varies greatly based on the size, ambition, and clarity of the initial concept. I've designed a couple games in an evening, while Android took approximately two years to finish. For my initial playthrough, generally I'll just solo the game for a few turns to make sure things are flowing the way I envisioned. After that, I step it up to actual playtesting with others, and that continues until the game is ready for prime time. jdodson: For aspiring board game designers I wonder what you recommend they do to break into the industry? Kevin Wilson: Another hard question. 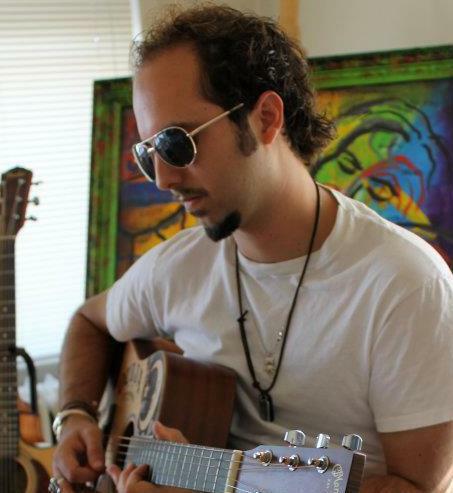 I was undoubtedly in the right place at the right time when I broke into the industry. You can't really engineer something like that. What you CAN do is present a professional personality and appearance, be friendly and courteous to EVERYONE in the industry you talk to (you never know who will turn out to be the key to your future career), and do your research. By that I mean to include not only books on game design, but actually study the products made by the game companies you are interested in. Also, cultivate other hobbies and interests besides gaming. It's not only useful to be a more well-rounded person when trying to break in, but if you DO make it into the industry, you can find yourself swallowed up by the job if you don't have other things to anchor yourself. jdodson: I love Doom. I couldn’t get enough of Doom and one year many moons ago I picked up Doom: The Board Game. Quickly it became my favorite board game of all time. I love it because it totally threw me for what I thought board games were. It had awesome pieces, the rules fit the mood of the game and it had a tone I hadn't seen in a board game before. I was blown back by how well a first person shooter translated to a board game. Oh, and its hard as hell, which is awesome. That said, if you could beg my indulgence as its been out for many years now, I had some questions about it. jdodson:When I first sat down to play the game with my wife I wanted to collect everything and take my time with going through the scenarios. She stomped my face into the dirt and I quickly learned the point was to escape alive. I wonder, where the focus on the escape and evasion rather than the typical dungeon crawl came from? Kevin Wilson: I wanted the marine players to be afraid. If they kept fighting and dilly-dallying, they would eventually be overwhelmed, dragged down, and defeated. This motivates them to move through the level as quickly as they dare, in a sort of endless fire fight. I really wanted that desperation, and all the time the invader player is sitting on the other side of the table, taunting and laughing at them. jdodson: How involved was iD in the process of the creation of the board game? Kevin Wilson: iD wasn't involved any in the actual design, but they were very generous in providing nice 3d shots of the monsters from all angles posed however I wanted them. It was incredibly helpful when we had the miniatures sculpted. Overall, they were pretty pleasant to work with, I thought. jdodson: This game is generally panned as being very difficult. Ill admit, I lost all of my early games as a lone Marine. Part of the games charm is how difficult it really is, for me winning is a badge of pride. That said, I wonder for you what do you think about its difficulty now? Have you been designed a game that was more difficult by design or chance? Kevin Wilson: It was interesting to see how difficult many people found playing the marines, and the various ways they reacted to that. When I designed Descent 1st ed., I purposely started the quests easier for the heroes at first, and then ramped them up over time because of the violent reactions some folks had to Doom's difficulty. It's tricky to gauge that sort of thing because no two gaming groups are the same, and that makes the 50/50 win ratio that some expect kind of impossible, assuming it's even a worthwhile goal. People forget that just because a game plays one way for their gaming group, doesn't mean it plays that way for EVERY gaming group. Still, I won't deny that the difficulty of playing the marines in Doom was an unpopular choice. As for more difficult games, I'd say that I've cranked the difficulty of Arkham Horror beyond that point when you take into account the various expansions. I've always found it funny how players keep asking for it to be harder. Well, at least up until Innsmouth Horror. I think that expansion finally scratched the difficulty itch for players. jdodson: Over the years as you have experienced people playing your games, I wonder what has surprised you the most about that? Do people experience your games in ways you didn’t expect? Kevin Wilson: Hmm, I'd have to say that seeing parents playing Doom with their kids was quite surprising for me, given the source material. That said, I was very proud of that, and made sure to anticipate it more when designing Descent 1st ed. Other than that, I don't know that I've been "surprised by" so much as I've "learned from". Games are sort of like a conversation between the players, and the best designers learn how to slip in what they have to say without interrupting the players. I feel I've succeeded some at this and failed some at this, but I always strive to push my skills to the next level with each new design. jdodson: What have you been playing lately? Kevin Wilson: My group has been playing a fair amount of Quarriors and King of Tokyo lately, besides our usual mainstays of Cosmic Encounter and Battlestations. I'm not really sure why we've gravitated to lighter fare lately, but we certainly have. jdodson: What game do you think really encapsulates what you love most about gaming? Kevin Wilson: If I had to choose a single game, it would have to be Cosmic Encounter. It's endlessly replayable, and it creates all sorts of interesting dynamics between the players at the table that shift over the course of the game. All that and it's a simple game to learn and teach. It's truly a gem of a design. Now, on the other hand, if I were to choose a game designer who encapsulates what I love about game design, it would have to be Sid Sackson. He was a master of crafting wildly different experiences with each of his games. If you look at I'm the Boss!, you get this tense, freewheeling negotiation game. Acquire is a wonderful mix of luck and skill with some incredibly clever bits. Can't Stop is an exciting press-your-luck game...the list goes on and on. He always had something new to say with each release. Sid was really an amazing guy. jdodson: Are you going to be making a game on your own or consulting in some other way? If you are going to be building a game, do you have any details you want to share about it? Kevin Wilson: Well Jon, having left FFG, I'm going to be going out on my own as a freelance designer. That means I'll probably be doing a mix of work-for-hire and my own original concepts, which I'll then attempt to sell to a company. Some of those projects may very well be with FFG, since I'm still on good terms with them. I can't speak about anything I'm working on yet except to say that I'm definitely planning on doing a collaboration with Eric Lang (Chaos in the Old World, Quarriors) later this year. I want to thank Kevin Wilson for taking the time to answer my questions and wish him well in the design of his next games! Such a fun article! And there's so many games mentioned here that I want to try now! At this years Portland Retro Gaming Expo I was able to try out the new GameDock for iPhone, an awesome device that turns your phone into a console. The GameDock features retro styled NES controllers and using them makes iPhone games much more awesome to play. I was able to ask one of the Cascadia Games developers Chris some questions and he awesomely shipped me back some information. jdodson: So Cascadia Games started with iPhone games. I wonder at what point you decided, "Hey, we need to make the iPhone a console!" Chris: I honestly don’t know when it clicked. I was in the middle of developing Cavorite 2. A lot of folks complained about not liking... Read All At this years Portland Retro Gaming Expo I was able to try out the new GameDock for iPhone, an awesome device that turns your phone into a console. The GameDock features retro styled NES controllers and using them makes iPhone games much more awesome to play. I was able to ask one of the Cascadia Games developers Chris some questions and he awesomely shipped me back some information. Chris: I honestly don’t know when it clicked. I was in the middle of developing Cavorite 2. A lot of folks complained about not liking the touch-screen for controls in the first one. I’d added iCade support, but the big arcade stick didn’t fit the retro console vibe I wanted. I had the Super Nintendo in mind with the games. I was also playing around on my old SNES quite a bit for inspiration. So somewhere around that time, the idea popped into my head that a phone could be the ultimate game cartridge. a game with on your TV? Chris: I pitched my friend Andi on it in January (or so). By March, he had come up with a prototype based on our ideas and research. We decided we had something worthy of Kickstarter. So we got in contact with a small company up here called FunGizmos, who helped us polish it into a better prototype. jdodson: Apple isn't known as the most open of companies to work with, what is required to get permission or licensing to build for the iPhone? Chris: If you want to send data across the 30-pin port, you need to be part of their MFi program. It’s fairly involved to go that route. We opted instead to make the GameDock work like a keyboard in the same fashion that an iCade works. That sidesteps the direct need to seek Apple approval. Eventually, however, we’d like to be involved with MFi. jdodson: The GameDock dock doesn't look to be tooled(iPhone 5 uses a new dock connector) for the newer iPhone 5, is it still compatible with iPhone 5? Chris: It won’t charge your phone since we don’t have lightning-compatible parts. But the game controls are sent over bluetooth. So you can still play games with the iPhone 5 without it being docked. jdodson: You funded your Kickstater campaign(congratulations on that btw), when do you anticipate the GameDock will ship to your project funders? Chris: Thanks! We’re pushing to get them out by December. It’s not totally in our hands, of course. We need to get stuff from our suppliers in time, for example. We should have a better shipping date estimate by the end of this month. jdodson: Do you plan on selling the GameDock as a stand alone product outside the Kickstarter? Chris: Yes. You can actually pre-order them from us now at http://iosgamedock.com/preorder. We’re building more than we need to fulfill the Kickstarter requirements. After that, it will depend on demand. Ideally, we’ll be able to find a distribution partner and go for a big production run. jdodson: What was the trickiest part of building the GameDock you didn't anticipate? Chris: Easily the biggest issue is just explaining how it works. The fact that your phone doesn’t need to be docked (since the video adapter isn’t built into the board but rather is a separate cable), for example, has confused a lot of folks. There have been a lot of questions about which devices it works with (answer: iPhone 4 and up, iPad 2 and up, iPod 4th gen and up). Even just the goal of recreating the entire console experience isn’t clear to everyone. (Though I think when a person has a gamepad in his or her hands, it sinks in.) Additionally, people wonder where the games come from (answer: the App Store). That’s been a lot more work than I thought. We haven’t been clear enough explaining the benefits either. For example, now your mobile game can double as a console game; you can start a game on the TV then finish on the bus. Local two-player games are an added benefit too that you won’t get elsewhere. Chris: Easily when we first tried Mos Speedrun on it. The game just worked and it played great. Using the gamepads really changed some of these iPhone retro games from just evoking a style into games that were exactly like what we experienced growing up. jdodson: GameDock ships. The majority of people love it and it is getting positive reviews. What is the next move for Cascadia Games? Chris: The first thing is to make it an easy to reach and rewarding niche for developers to hit. We obviously want lots of games on there working well. Fortunately, so far developer response has been great given how early we are in the process. After that, I’d like to look at iPhone 5 charging and other mobile phone support. Ideally, we could find a distribution partner and really turn this into something big. Short of that, I imagine we would Kickstart a version 2.0 with a few improvements based on what we learn from this first run. We have some other ideas as well, but I’m not giving away any secrets! jdodson: Thanks Chris and congratulations and good luck with the GameDock! Mindwedge, an indie game company recently released its first game called Monster Minis Extreme Off-Road and I was able to virtually sit down with Dave and ask him a few questions about it all. You can easily snag the demo for Monster Mini's on the website and the full meal deal is available on Beamdog and Desura. jdodson: What was the inspiration for Monster Mini's? Dave: For inspiration I look to my creator first. It's my feeling that I can do no greater honor to him than to emulate him by being creative. But on a more practical level, I think that there were a few influences in play. I really enjoyed off-road ATV as well as off-road truck racing games. 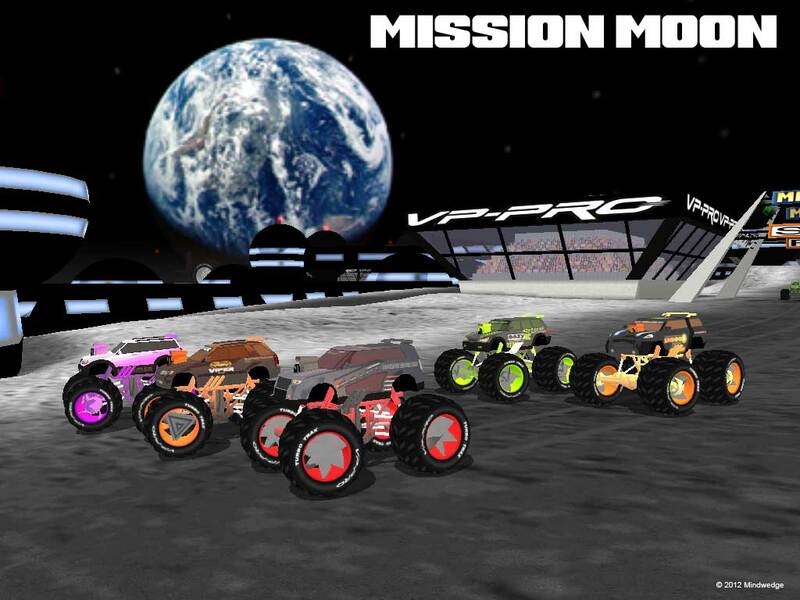 One day I was... Read All Mindwedge, an indie game company recently released its first game called Monster Minis Extreme Off-Road and I was able to virtually sit down with Dave and ask him a few questions about it all. You can easily snag the demo for Monster Mini's on the website and the full meal deal is available on Beamdog and Desura. But on a more practical level, I think that there were a few influences in play. I really enjoyed off-road ATV as well as off-road truck racing games. One day I was toying with a very rudimentary game engine and was working with a futuristic style miniature vehicle I had modeled, and I stuck huge wheels on it just for fun. Then it struck me that I had hit on something I really liked. Not the car, but the huge wheels on it. I wanted to make a racer though, not a stadium showpiece. I have always liked the monster truck shows ever since the early days of Bigfoot, but a 'proper' monster truck wasn't right for racing outside of an arena. By combining the ATV with a truck frame of sorts, I came up with a new hybrid - the Monster Mini. As for making racing trucks as SUVs, I've owned a few and they seem to be very popular still. So I guess I have a special attachment to that. Though to be honest, our SUV right now is a Mini Cooper S hatchback, and I have a 4x4 pickup for bigger jobs and off-road excursions. jdodson: What was the muse you followed to start Mindwedge and make video games? Dave: That's kind of a different way to ask the first question perhaps, but If I had one thing to point to it would be RC truck racing. My first RC truck was a Tamiya Midnight Pumpkin. It wasn't a racer really, but the proportions of the monster Minis emulate the Midnight Pumpkin more than any other. Later I went on to race more capable RC trucks at indoor and outdoor tracks. RC trucks at the time were really just conversions of RC buggies. I still keep those race trucks on the hutch of my desk to this day. I had also worked at a stretch limo manufacturer in the early '80s, and that is probably the inspiration for the limo style trucks we included later in the game. Overall, it's about doing thigs you can't do in the real world. That's the great part about games - they don't have to follow reality. jdodson: How long has Mindwedge been making games? Dave: As I mentioned, I had been toying with a rudimentary game engine. That was in 2003. Then I ran into Chris Robertson who was at the time working beyond the norm with extending the abilities of that engine and I asked him to join me in making some Monster Minis. It turned out to be more of a toy than a full game really, but we had great fun with it. Then in 2004 we came across a more capable game engine and realized that we could make a really decent game with it. As we were getting up to speed on the new engine we ran across another engineer who was also working beyond the norm at the time - Ed Phillips, who was very interested in getting under the hood of some of Chris' work. I knew we needed to bring him in. The rest is history. We're still working as a team to this day. Mind you, the early years were as much about learning how to make games as they were about producing a final product, and we did accomplish both. The learning part is never really over, and that's the great part. There's always a new challenge around every corner. jdodson: Looking to the future, what do you see as a game genre youd like to do something in? Dave: Well, my other favorite genre is the FPS. The first game I ever played on the PC was Wolfenstein 3D. That's when I was hooked on 3D games. But I like that racing games are basically non-violent. I hear from parents all the time that say they need more non-violent games for their kids. We have several other racing game concepts we want to work on. We already have our game systems in place for racing and can continue to refine them as we go along. So as a practical matter, we'll be doing this for a few more years at least. jdodson: What are you most proudest of in Monster Minis? Dave: Through the thick and thin, I'm most proud of the quality of the people I get to work with. It's very rare to have team mates that stay with it for as many years as we have. I think that speaks to the basic values everyone on the team has. Along with that, I get to work with some of the most intelligent people I've ever known. Going forward, I know it's going to be a challenge to find more team mates of this quality as our team grows. But we have a good foundation to build on now. After the first few minutes of meeting Steve Ellis it’s apparent we share an unadulterated love for gaming. 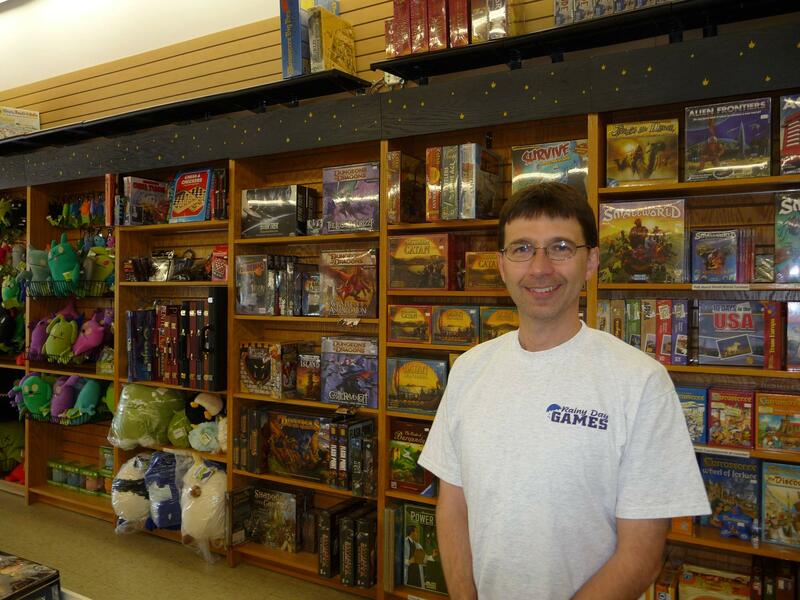 Steve Ellis runs Rainy Day Games, a local game store that sells many classic games, miniatures, RPGs, card games and puzzles. I was able to sit down with Steve so we could talk about gaming. Rainy Day Games started 14 years ago after Steve and his business partner Jeff met playing Magic: The Gathering. Steve dropped the idea of starting a store together and the idea stuck. Both decided to forgo being paid at first and continued to work day jobs during the first few years. In looking back, Steve is happy they did this as it helped the store get on it’s feet. One... Read All After the first few minutes of meeting Steve Ellis it’s apparent we share an unadulterated love for gaming. Steve Ellis runs Rainy Day Games, a local game store that sells many classic games, miniatures, RPGs, card games and puzzles. I was able to sit down with Steve so we could talk about gaming. Rainy Day Games started 14 years ago after Steve and his business partner Jeff met playing Magic: The Gathering. Steve dropped the idea of starting a store together and the idea stuck. Both decided to forgo being paid at first and continued to work day jobs during the first few years. In looking back, Steve is happy they did this as it helped the store get on it’s feet. One thing that helped Rainy Day Games succeed when it opened in 1998 was the explosion of a new card game called Pokemon. Legions of kids bought, played and traded collectible cards helping fuel the first few years of the store. What Steve is most proud of with Rainy Day Games is the community and the continued success of the store. They host regular events for Warhammer, Magic: The Gathering, Board Gaming, D&D, Pokemon and HeroClix. Rainy Day Games has events happening every day of the week. If you haven’t made the plunge into more modern board games, Steve recommends you check out Ticket To Ride. Ticket to Ride is a train adventure where players claim railway routes connecting cities and competing for the highest score. Days of Wonder’s hit showcases the best of breed for what board gaming has to offer as the rules are well explained, simple and it's easy enough to teach your friends. Steve notes that much has changed since the early 70s and 80s for board gaming. Citing higher re-playability, an increase in quality of game pieces and an unbelievable attention to detail, modern games have come a long way since simpler days of Risk and Monopoly. Steve cites the rise of influential Euro style games in the 80s and 90s as one reason modern board games are better. Since so many great games exist, if you read the game box and it looks good, the chances are high you will love the game. That said, Steve notes that because there are so many new games released many great games go unnoticed because the bar is set so high. Often people are reluctant to purchase board games that range from $50 to $100 because of a perceived lack of value. Steve points to many games that adorn Target with a $15 price tag as examples of why people feel games have little value. As publishers hit quarterly revenues and keep profits high, most games in chain stores are made cheaply, simply and have little replayability. Steve compares buying a great board game with taking your family to the movies. Since the average family can spend so much on a movie, the value of a great game that can be played again and again makes sense. As Steve talks more about the amazing feeling of opening a new board game, reading the rules, bagging up the pieces, and playing it for the first time with his friends, the love for what he does is apparent. Rainy Day Games is a local game store I now frequent for board game events and pre-order the latest awesomeness I am into. If you are in the market for getting a new game or want to try something new, say hi to Steve and give Rainy Day Games a try. You just might have some fun.